Flat Silver framed 12X36 unbevelled mirror, an unbevelled mirror with a brushed silver frame, with a black outer edge. Overall size.38X98cm. Flat Silver framed 12X36 unbevelled long slim mirror. This is a unbevelled mirror framed in our own workshop. 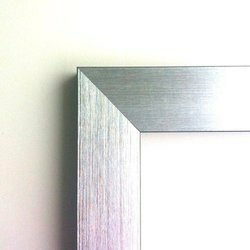 This brushed silver frame has a modern flat profile with a black outer edge as shown in the detail picture below.